It's Day 2 of My Creative Time April Sneak Peeks, and Emma has a gorgeous stamp set for you today! Bloom Where You Are Planted is filled with beautiful flower images, along with sentiments made with the perfect fonts. I can't tell you how much I'm loving this set! 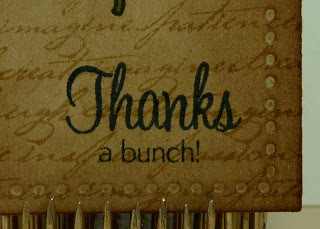 To make my tag, I used kraft cardstock with the Papertrey Ink Tag Sale #3 die and stamped Emma's Script Type Backgrounds on it with kraft ink. I then inked it up with dark chocolate ink. 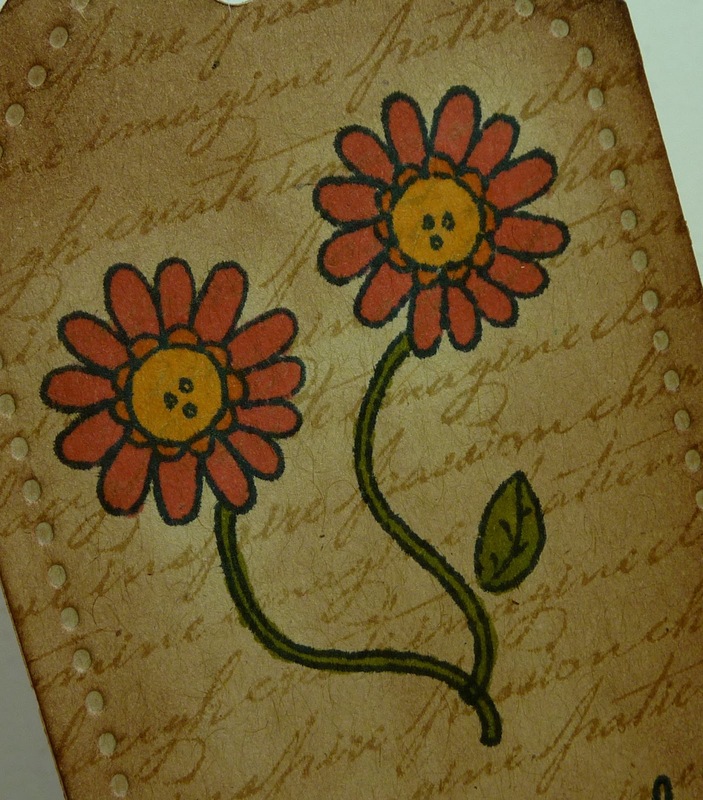 The flower image I used is just a single flower, but I stamped it twice, masking off the leaf with the second stamp. I used Memento Tuxedo Black Ink, and colored the images with Copic markers. Don't you just love the fonts? Here's how the finished tag looked on a pretty basket of plants that I was giving to somebody who helped me out a lot while I was in the hospital recently. 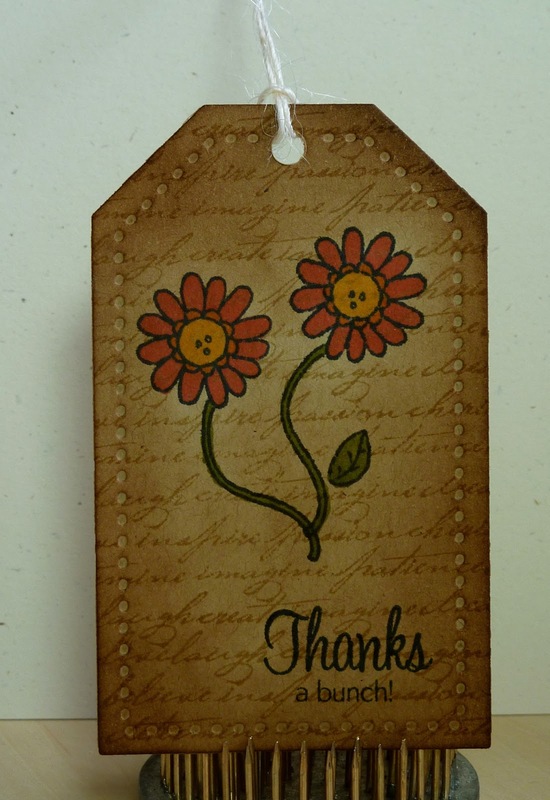 I love how a homemade tag gives a gift that special touch! Great tag Katie. I love that you add Emma Script Type on you tag. The person receiving this basket will love it. TFS AJ! I agree! And your inking is perfect! Love this! Isn't it nice to be able to incorporate different parts of her other stamp sets? Love this! So pretty!! the perfect tag for a bouquet of flowers!! Everything about this tag is just so pretty! I love the background stamping and the flowers just pop against the vintage background. This is just the most gorgeous tag ever! I was wondering how you got that embossed look around the edge! It's perfect Katie!! Katie ~ I LOVE this tag! SERIOUSLY LOVE this tag! The background is such a FABULOUS choice for these flower images ~ I am so lifting this idea! Then you inked it to perfection! I need to do some of these images on Kraft! I NEVER think of it! Katie whoever get this AMAZING tag with those GORGEOUS flowers is totally going to LOVE it and them! What a beautiful tag!!! Love love love the inking!! Love this tag! Love the background paired with the distressing...looks so great!!! Love the flowers....awesome!!! Once again you have another great project. Love it. I love this tag! Nice coloring. very pretty, love the coloring!!!! Love the antiquelook you creeated on the tag. Love the tag, the colors are brilliant, you are an awesome copic user. TFS. I love how your tag turned out...the stitching on it is a wonderful idea. I hope you are feeling better every day! Hi, What a beautiful tag, thanks for sharing. Great tag--I like the script on the kraft. Such a sweet tag...I love the kraft! Katie what a fantastic tag and you did a great job on it!! This looks like another winning release! Beautiful project! I love your tag! Its just beautiful! Too cute. Love, love, love it. Lovely tag! I like how you used the script background stamp, too. Beautiful, beautiful tag, Katie. Also, CONGRATS on being chosen for Jinger's design team. looking at your tag, gives me an idea how to use it instead of a card. Thank you! Love the tag! What a great way to give a gift basket:) the flowers are perfect. Great tag, its really beautiful. Thanks for sharing. Super cute tag!! Love the distressed look. 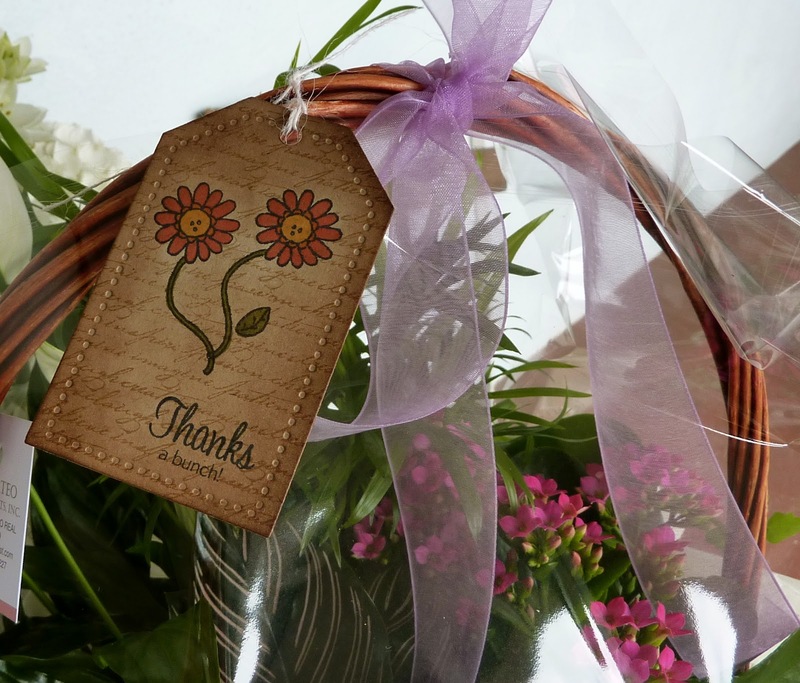 Your beautiful tag is a great addition to the gift basket. Oh my, I am loving these flowers and beautiful sentiments! Love the font on the sentiments too!! So cute are these flowers!! I must scraplift this idea. Tag is so prety. I think anyone would really appreciate a handmade tag like this one. Love your choices of Emma's and papertray's products. Beautiful tag. The vintage feel is a great touch. Thanks! Love the cheerful tag, the stamps are just delightful.